In a New York minute, interior designer Manuella Moreira went from being a designer with great potential to catapulting to celebrity designer status. Manuella has been on our radar since the beginning of the year to be featured in our popular Potentials series, but she pumped the breaks and got her design career in Designerlebrity formation. Within a few short months, she pursued press worthy design projects, hired celebrity photographer, Alan Barry to capture her entrepreneurial appeal, starred in Ethan Allen's design service commercial video and became a keynote speaker at a recent Designerlebrity event. All slay moves to earn her Designerlebrity positioning and a well deserved spotlight feature. Her hustle game is strong and she epitomizes one of our favorite taglines: "Don't Hate The Player, Change The Game." Keynote speaker at the Designerlebrity event hosted by Ethan Allen on May 17th. The event broke Tastefully Inspired Facebook LIVE viewing records and became Ethan Allen's flatiron location most shared design event on social media. Manuella has the skills to pay the bills. Her drive puts racers from Fast & Furious to shame. It's her dedicated passion to not be influenced by the industry but to learn from the industry's credible influencers. Manuella is not killing it with a self name design firm, enormous social media following or participating in the industry's cliques. In fact the design industry could give her a side eye for making her bones at one of our favorite retail furniture stores, Ethan Allen. That's right, Manuella is a design consultant at Ethan Allen and although the industry has yet to truly recognize and applaud retail interior designers...well let's just say we don't do cliques here at Designerlebrity. We recognize talent and Manuella is a "put your hands together" and "light a match" because this designer is on fire! We all can imagine the different types of personalities that come into the Ethan Allen store. All needing interior design guidance, but many not willing to relinquish complete control. Manuella has earned her client's confidence throughout her years at Ethan Allen and she has navigated those clients that want to partake in the interior design process. Case in point with a recent young client by the name of Ashley who is 14 years old and knows exactly what she likes. 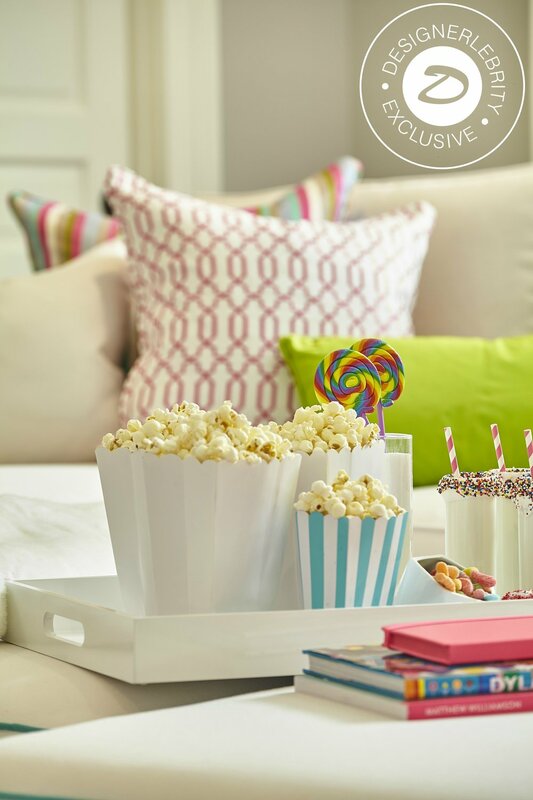 Designerlebrity was able to get the exclusive first look at Ashley's fun, yet sophisticated media room meant for hangouts, movie nights and sweet treats to share with her friends. 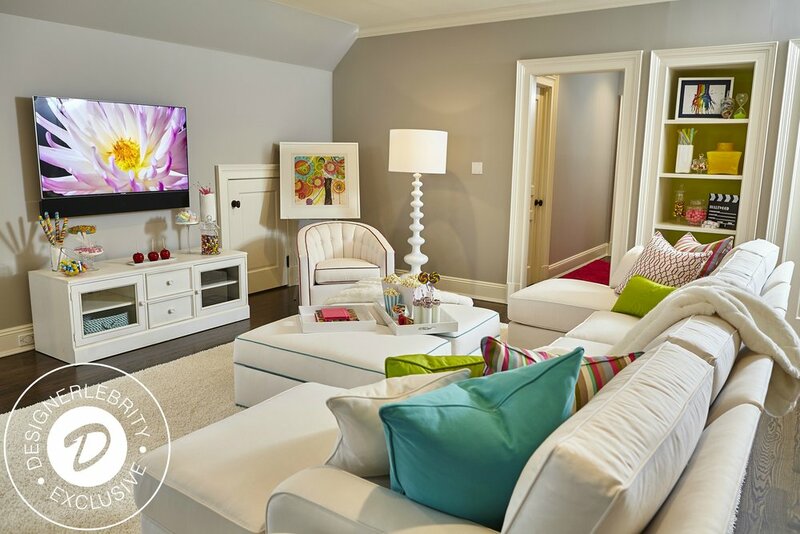 A tamed colorful space she could call her own and with the help of Manuella, was able to design a teen's ultimate wonderland media room. Manuella continues to handle multiple design projects working at Ethan Allen's flatiron location where you too can meet with her and create your own wonderland moment befitting of your personality. But we have a feeling there is so much more instore for this incredible designer with tremendous "potential".